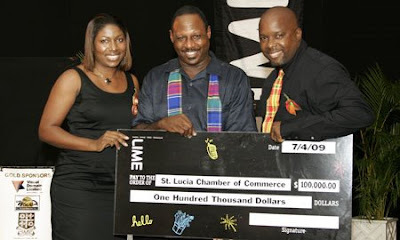 LIME is teaming up with the St. Lucia Chamber of Commerce, Industry and Agriculture for Jazz on the Square 2009. The company is the Title Sponsor and exclusive telecommunications provider for the event. In addition to a cash contribution, LIME is providing telecommunications, technical and manpower support for the 5-day six show event. Jazz on the square is scheduled for May 4 to 8, 2009. Executive Director of the Chamber of Commerce, Brian Louisy praised LIME for coming on board as a sponsor and expressed his appreciation for the support. Jazz on the Square is a hugely popular lime with St Lucia Jazz fans, especially persons working in the city centre. Every year hundreds of fans converge on the Derek Walcott Square during their lunchtime break and take in the superb music from world-class local and regional artistes. The Chamber Executive Director said he is expecting another great turnout this year.